I have been using FT8 with the G4TPH loop antenna and am impressed with the performance, have done a few tests with different antennas including my end fed long wire which goes over the top of the house. The loop is inside the loft space against the rafters and it’s very easy to tune and out performs the longwire. it’s extremely quick and exchanges info with the other station automatically once connected. If receiving only you can see who you are receiving eg: 54 countries in 24hrs for me, yesterday. I am using several bits of software depending how I’m receiving or if I’m transmitting. There are drop down boxes at the top for bands, signals or countries, received by or transmitted by, anyone or callsign/grid square or country of callsign, an empty box where you can input a callsign and over the last 24hrs down to 15 mins. Also in the settings you can set your transceiver type if you wish to transmit, if you have a transceiver such as the FT991A then the software will control the frequency on your transceiver too and acts as a stand-alone piece of software. If you are monitoring only then you need to set the rig to none. The other software I have is SDRuno as I also have an SDRplay and run that on FT8. I am a real convert to loops now but the G4TPH loop is the only transmitting loop i have, I do have receive only loops, home built and commercial but for the price the G4TPH loop is exceptional. If anyone wants to try WXJT-X take a look on YouTube I’m sure you’ll be impressed at the number of people raving about it. At 67 years old myself, who says you can’t teach an old dog new tricks. Thanks again Tom for the loop keep up the good work. Starting to run receive tests on my antenna’s and the G4TPH loop is in the loft and thought you might like to look at the first 24hr run on FT8. So your antenna has been on my balcony this long. I used it once on 20 meters with a local station, so I'd say that wouldn't count. Yesterday I decided to get into digital modes, JT65 in particular using less than 40W. For my surprise I got calls from California, South Brazil and Asia. So, it's more than fair to say that your antenna works like a charm! Now it got me thinking I should get a FT-817 and get into QRP on top of a mountain. antenna and use the loop which is safe in the attic thanks Lawrence. ........The antenna performs much better than I had hoped and the SWR is incredibly low across the band once I get the capacitance adjusted. You really have a "winning design" here. 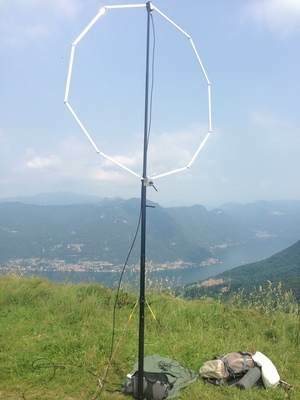 here is your antenna on hilltop near Lario lake. it's a shame that propagation was very, very negative! G4TPH HAS A GREAT PRODUCT !!!!! I had used loop antennas before without much success. I sold my other commercial unit for another purchase. When investigating another one I chose the G4TPH for cost as much as anyting else.I ordered the antenna over the intenet.When I got the confirmation found I had ordered the wrong unit. Tom gladly changed the order and sent me the other unit. I had paid via Pay Pal as a guest. He sent the upgrade at no charge.It arrived in 7 days from order and was packed nicely.It was quickly assembled and was suspended from a light fixture in the "shack". You HAVE TO GET IT ON THE AIR ! One contact to W.Va. and not much luck the first day or the second.AND THEN !!!! I heard SM5CAK finishing a QSO on 15 meters CW.HE CAME BACK FIRST CALL. We had a nice chat and he sent me a 559...AMAZING.....4600 miles on 30 WATTS from INSIDE THE SHACK!! !I will do another report when camping season comes around but my first impressions are FINE BUSINESS TOM.Given how this antenna works as it does from inside the house ...I can only imagine how well it will work in the great outdoors! Thanks very much Tom for your product. Tom, just got back from a week of depositions in New Orleans. Your small package was waiting. I put it together pretty quickly with considerable scepticism, but I was AMAZED at the results. I slapped my MFJ Analyzer on it and could bring it down to almost 1:1 on all bands with your capacitor, so your 1.2/1 is very conservative. Then, I called my cousin, KE9IK in Illinois and set up a QSO. He said that I was 58 to 59 from Houston. I am attaching a photo of the loop using 10 bars instead of 12 dangling off my closet door on the second story of our house. No DX yet and frankly I don't have any time for it, but your loop does work and work well. Perhaps it will work out well in my business travel as most hotels are hermetically sealed these days. Congrats on an excellent product. Feel free to use my endorsement and photo in any ad. 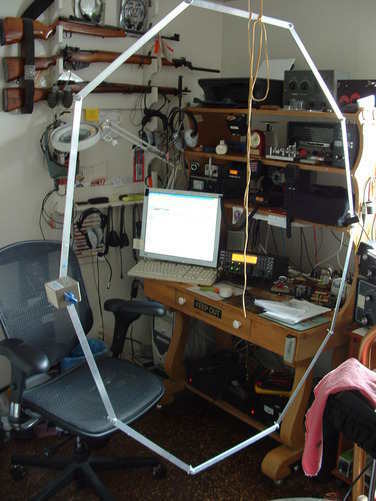 "i have one of your ml40 Magloops and i would like to take this opportunity to tell any prospective buyers that i have worked most of europe, russia, east and west coasts of north america and a few countries in south america with this antenna indoors in a first floor bedroom! this was exclusively on psk mode and only on 20w! i have no connection to the maker of the antenna (G4TPH). 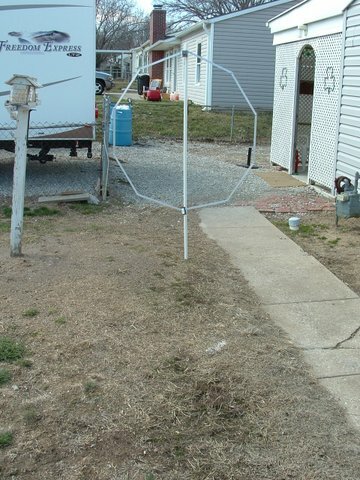 just thought i'd pass on my experiences of using this antenna." Amazing result considering that the loop is indoors around the window.Much stronger sigs and less noise than my verticals.Can I run 20W with this antenna? What do you think the max it can handle would be ? Also the clarity of SSB is the best so far.I will let you know more shortly. Well done for a great solution to no antenna space .